When footage from the Black Mirror episode “USS Callister” was first released, it’s a safe bet that everybody had pretty much the same thought: Why, it’s an episode based on Star Trek! And of course, to some degree, that assumption is perfectly correct. USS Callister tells the story of a classic sci-fi show called Space Fleet that’s very much in the vein of Star Trek. But as is revealed in the episode, it’s really the story of modern-day tech company’s quietly monstrous CTO (Jesse Plemons) who virtually escapes into an immersive virtual version of an old TV show — and drags clones of his coworkers into his sci-fi world so he can torment them mercilessly as an all-powerful god. As part of a series of interviews with Black Mirror creator Charlie Brooker talking season 4, we briefly discussed “USS Callister” and the other inspiration for the episode — which wasn’t initially Star Trek at all, but rather another 1960s-era TV series, the one that most directly inspired Black Mirror in the first place, The Twilight Zone. 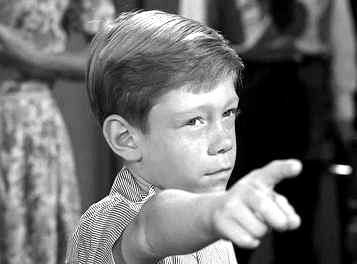 Remember the 1961 episode “It’s a Good Life,” about a town terrorized by an all-powerful 6-year-old (who even looks a bit like a young Plemons)? ENTERTAINMENT WEEKLY: When we last spoke, you hinted that a certain other piece of material inspired “U.S.S. Callister” beyond Star Trek. I’m wondering if it was the classic Twilight Zone episode “It’s a Good Life”?